Sassy Google Employee To Arrington: You Shall Not Pass Whilst Talking and Driving! Yesterday, TechCrunch's Michael Arrington was driving around Google's campus, talking on his phone trying to figure out where exactly his meeting was. One righteous Googler didn't approve of Arrington's potentially unsafe talking-while-driving, so he took a stand. Literally. In what Arrington describes as the young man's Tiananmen Square moment, a stand-off ensued between the TechCrunch proprietor and the bespectacled Google geek. Thankfully, this moment was captured in photographs by both participants. ...this guy, who's wearing a Google employee badge, decides it's time to take a stand against cell phone use in cars. 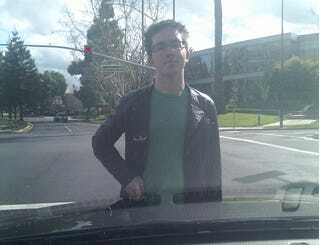 So he stands in front of my car and won't move...Cars behind me start swerving. I back up to go around him. He steps forward, vigilant in his defense of the law. I'm off the phone now, and snapping this picture didn't help getting him to move on. The light changes. The light changes again. Cars are now backed up behind me...I'm not sure what comes next in a situation like this. I can either drive over him or park my car. So I put the car in park, open the door to get out and discuss the situation with him. That's when he ran away. His mission, apparently, accomplished. @arrington If you really want to talk about this, let's do that when your car is not abandoned in the road.